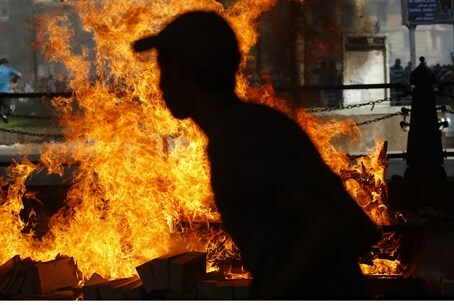 One person killed in in clashes that erupted after an Egyptian court dismissed a murder charge against former President. One person was killed in Cairo on Saturday night, in clashes that erupted after an Egyptian court dismissed a murder charge against former President Hosni Mubarak over the deaths of protesters during the 2011 uprising. The ruling enraged Mubarak’s opponents, with about 1,000 converging on a central Cairo square to denounce the government, according to the AFP news agency. Seven of Mubarak's security commanders, including former interior minister Habib al-Adly, had also been acquitted on Saturday over the deaths of some of the roughly 800 people killed during the revolt. Mubarak and al-Adly were sentenced to life in prison in June of 2012 for failing to prevent the deaths of over 800 protesters during the 18-day uprising that began on January 25, 2011. Mubarak ruled Egypt for almost 30 years before being ousted in the uprising. The court later accepted Mubarak’s appeal and ordered a retrial, but the former President remained behind bars because other corruption charges were filed against him. In August, following the ouster of Mubarak’s successor Mohammed Morsi, an Egyptian court ordered Mubarak’s release, after these charges were dismissed.